Great "getting to know you" activities. Covered with fun illustrations and icebreakers. Lots of clever quotes, questions and topics. A fun way everyone laughing and sharing! Our Toss 'n Talk-About® balls are great "getting to know you" activities, covered with fun illustrations and icebreakers like clever quotes, questions and topics to get everyone laughing and sharing! 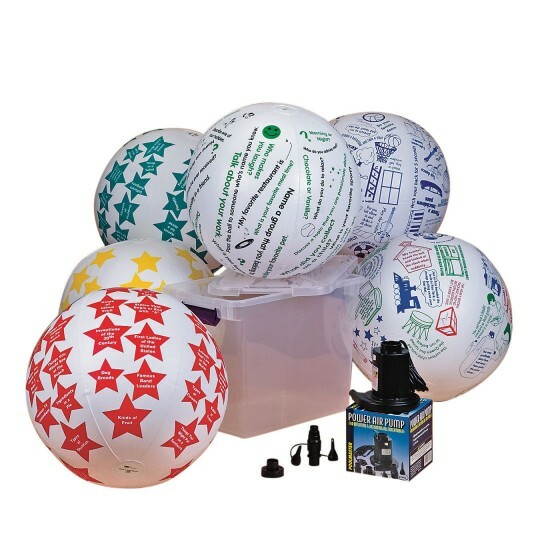 Includes 6 of our most popular Toss 'n Talk-About® balls, an inflator/deflator and a convenient storage container. Each 24" ball comes with its own game and activity ideas and repair patch. Assortment may vary.